Talking about F1: The F1 blog: What did the Raikkonen-Alonso battle in Brazil tell us? Nothing. What did the Raikkonen-Alonso battle in Brazil tell us? Nothing. It is an F1 race, in 2014, and in the closing laps. 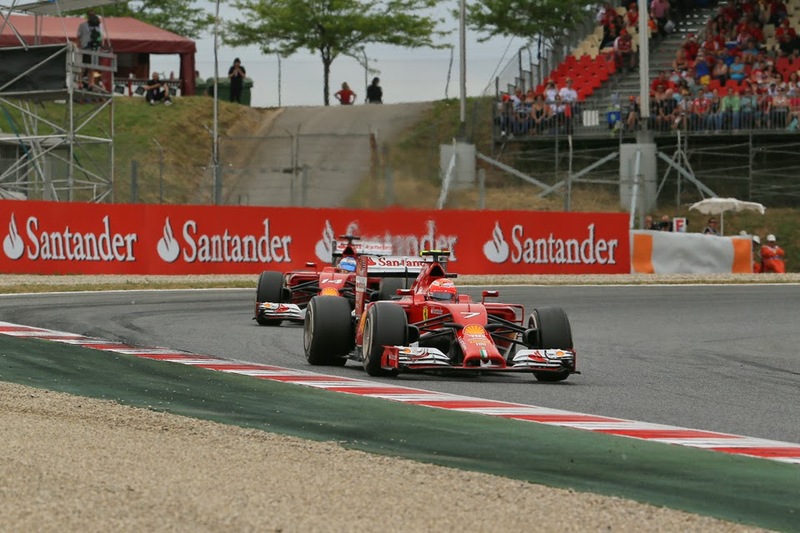 The two Mercedes are way off ahead in a tight battle for the win, but down in sixth place we have Kimi Raikkonen. He is in the process of executing a two-stop strategy, but bearing down on him from behind is his Ferrari team mate Fernando Alonso, who instead has stopped three times and is benefiting from being more freshly-booted. With ten laps left Fernando is right with Kimi, but rather than meekly cede the place Kimi is fighting for it for all he's worth. Clearly there are no instructions coming from the pit wall. Not that they'd likely be heeded anyway. 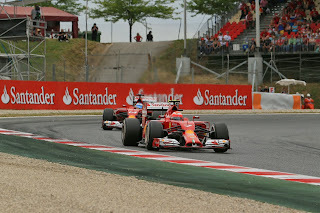 For several laps the two feisty racers tough it out, getting alongside each other at several points, but Kimi time after time is able to position his car so to remain ahead. That is until there are four laps left when Nando is able to get by; where he stayed. But still with the time lost squabbling Alonso had to abandon any vague thoughts of attacking Sebastian Vettel ahead, who'd passed Kimi himself shortly before Alonso arrived on the scene. You would be forgiven for thinking that I'm referring to the race in Brazil just passed last weekend. But forgive me, it was a deliberate attempt at a bum steer. Actually what I described is from the Spanish race earlier in the year. Round five. In May. But there's a point to my duplicity, so please stay with me. The point being that when the almost exact replication of Spain's goings-on happened last Sunday in Interlagos a good few people sought to draw significance from it. That, given the lack of a 'usual' team order for Alonso to be waved past his stable mate, it demonstrated that Nando was a 'dead man walking' at Ferrari (the latter bit which isn't at all a revelation in itself, but I digress). In case you didn't get what Brundle was hinting at his co-commentator David Croft explained. 'One of those guys still is going to be at Ferrari next year and the other we're still expecting very much to leave Ferrari next year' he said. 'I find this significant' Brundle went on. Croft added: 'For a team that has placed team orders in the forefront in the past'. 'Especially for Mr Alonso', Brundle supplemented. 'Quite' concluded Croft. Croft opined subsequently that Kimi would be 'relishing' the battle and Brundle that Alonso would be 'screaming on the radio'. 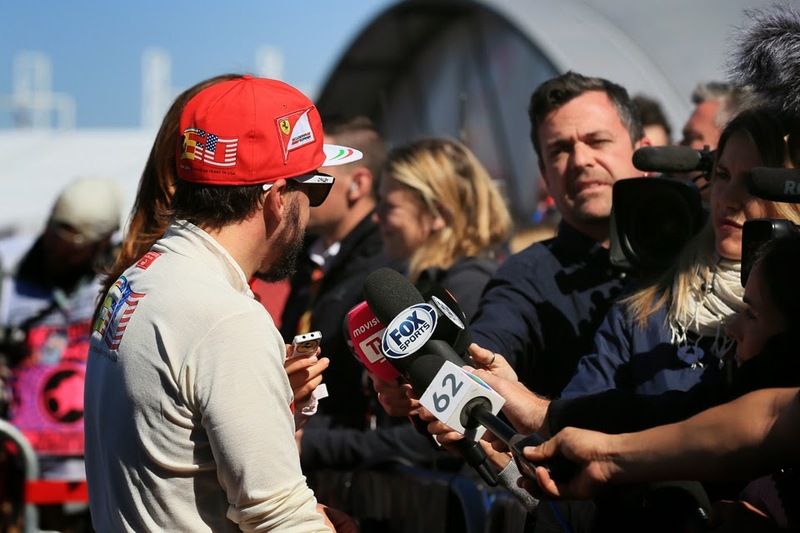 Then back to Sky and Rachel Brookes in both of her post-race interviews with Alonso and then with Raikkonen led with a probe on the same subject and one apparently designed to goad, to the effect that 'ooh, you must have been really annoyed.' Nando and Kimi aren't united on many things, but either looked equally perplexed at the questioning, but both too refused to rise to the bait and answered politely, saying essentially it was no biggie. It took Johnny Herbert in the after show to be the first to tone the matter down. And by now you may have worked out what the point in all of this is. That there's a massive problem with the conclusion many jumped to in and after the Interlagos race. In that if we work on the fairly safe assumption that last May when all circulated Spain's Montmelo track Nando wasn't then inexorably headed towards the Maranello exit door, that in an eerily identical scenario exactly the same thing happened as in Brazil. Which was not very much. There were no Ferrari team orders, and no obvious rancour emanating from either driver or from the pit wall at any point. Indeed the two cases where almost entirely indistinguishable in every way. Thus applying any sort of logic we can only conclude that in the Brazil intra-Ferrari battle there was absolutely nothing to see in terms of added significance, be it on Alonso's future - and Ferrari's response in kind - or on anything else for that matter. That Ferrari's approach evidenced in Brazil was in place long before Nando's moves of recent weeks to extract himself from the red team. Those getting into a froth at what the scrap meant were getting so over nowt. So what did the fuss reflect? Well at one level no doubt it reflected the insistence in many quarters including among a lot of the English-speaking F1 media to forever attribute Ferrari with nefarious motives (a phenomenon that goes back decades); team orders being a hook to commonly hang this on. And we can add the insistence among some overlapping crowds of attributing similarly nefarious motives, as well as an apparent determination that he'll 'spit the dummy' at every turn, to Fernando Alonso - whether it reflects a legacy of 2007 and all that or whatever. Therefore nasty Ferrari applying nasty team orders and moreover to the benefit of nasty Alonso is an especially intoxicating brew. And in this particular case the thought that nasty Alonso has had such nasty privileges suddenly withdrawn no doubt tickled their sense of schadenfreude, and they leapt straight to the conclusion that they wanted to be so rather than pause to apply scrutiny to it. Add also that sensation is always more enticing than the usually mundane actuality and we probably have our answer.